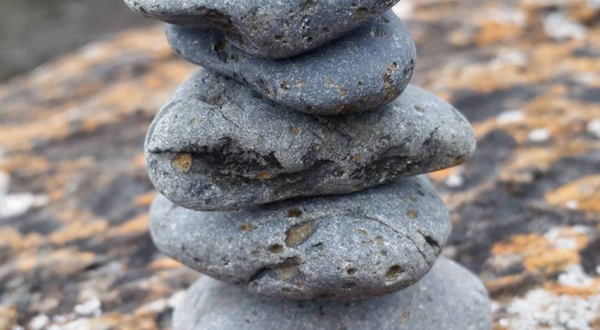 You might have seen these iconic emblem of Zen in your travels .. usually called ‘Cairns’ .. I have a few of my own small stones found on travels to far off beaches, each holding a sacred vestige of a memory .. sand, sun, holidays. In the Zen tradition each stone is said to represent a perfectly aligned intention or thought, and the structures are a symbol of balance and direction. When I was in Sedona, at a meditation retreat earlier this year, I had been hiking for a short time and found myself at the meeting point of two powerful rivers .. fast flowing with chilly water from the mountains. And there was a whole garden of stacked stones .. and the perfect moment to meditate in the sunshine! And here are two beautiful demonstrations by Michael Grab (Gravity Glue) and Pascal Fiechter (Gravity Meditation) .. enjoy!